What were those days like before Christ came to the earth? What would it have been like to live then? Today we have the Bible, which gives us an account of Christ’s birth, life, death, and resurrection. We can choose to believe in words already written. In one sitting we can read the prophecies of a savior and see them fulfilled. We’re on the other end of this story. But what would it have been like to live in the beginning? For centuries before Christ’s birth prophets prophesied of a redeemer, God promised to send a Messiah. For generations and generations the people of the world heard promises and had to hold fast to them. These people didn’t have any proof that Christ would actually come, no due date to mark on the calendar, no app to count down to His arrival–they believed because that’s all they had. Members of The Church of Jesus Christ of Latter-day Saints (often inadvertently referred to as the Mormon Church) are among the Christian groups that choose to believe in the power of believing. For a long time I wondered about the deep spiritual significance of Christmas–I know that sounds really bad. And here’s the thing: usually when we talk about the miracle of Christmas, we talk about what the Christ child went on to do after He grew out of the manger. We talk about His sacrifice, His miracles, His redemption. To me, those pieces of core doctrine–while paramount–are more suited to Easter. Redemption is what I celebrate in the spring when I celebrate the Savior’s resurrection. I know that it’s never a bad time to reflect on Christ’s grace, but something in my heart has always told me that something was different about Christmas. So I ask again, “What makes Christmas so special?” since we celebrate the rest of His life on a different holiday. What would it have been like to finally see the new star signifying that Christ was born? What would it have been like to be the shepherds who welcomed the angel? What would it have been like to be the wise men who traveled miles upon miles to meet a babe whom they merely believed would actually be in Bethlehem? 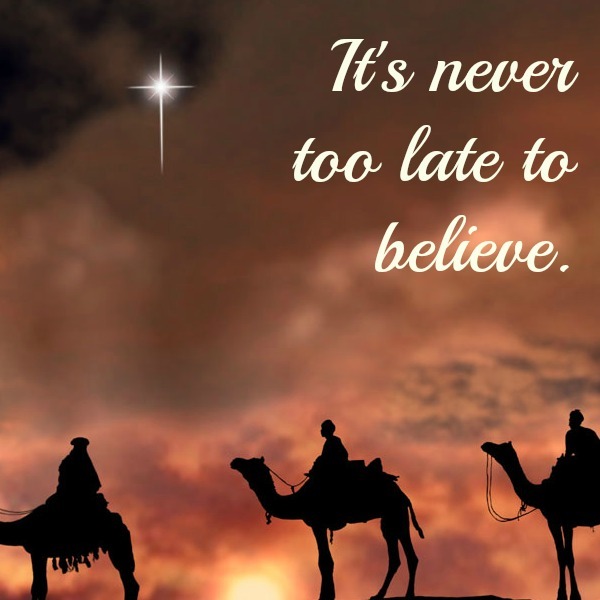 What would it have been like to have been a believer when Jesus was born into this world? Christmas isn’t necessarily about redemption itself–it’s about the promise of redemption, the promise of peace. For centuries–centuries–God promised His children a Savior, and for centuries those children had to believe that it would happen. Millions and millions of men and women died without seeing that promise fulfilled. Some probably even lost faith as they waited. The miracle of Christmas is that God keeps His promises. He promised us a savior, and in His own time He sent His own Son to be born among farm animals in a stable. He sent us prophets and signs. It might have been easy for some to doubt Heavenly Father, but He followed through on what He had promised. Even when we fail, Heavenly Father remains steadfast. His promises are sure, even if they’re a long time in coming. Christmas is faith realized, belief proved. Christmas is evidence that our believing is never in vain, not if we anchor our belief in God’s promises. Christmas is a celebration for the believers, and it’s a beacon of hope for those who don’t believe, but who desperately wish they could. 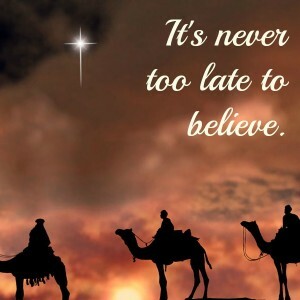 It is never too late to believe–that’s the message the Christ-child brought with Him. That’s the message we can hold to when we don’t know what else to believe. Believing is sacred, believing is living. It’s never too late to believe. The thoughts for this post are taken from an article which originally appeared on smallandtrivial.blogspot.com.